This article is part of my Ramadan 2019 compilation. 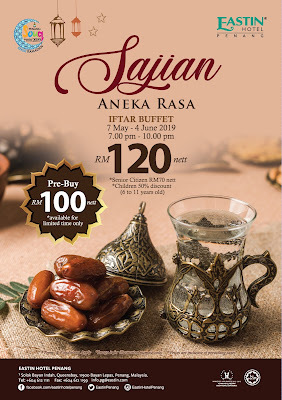 This year, Royale Chulan Penang serves Ramadan buffet dinner from 7 May 2019 to 3 June 2019. Themed "Sajian Nostalgia", the menu is crafted to revive traditional Malay dishes from the yesteryears. Held in Sri Tanjung Cafe, the dining area is decorated with Kampung Boy cartoon figures. 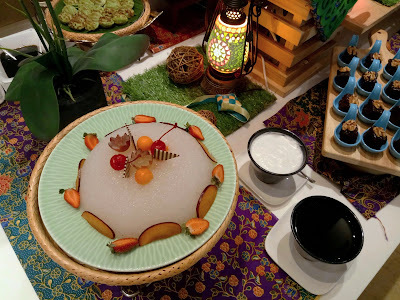 Bubur Lambuk is an essential appetizer for iftar meals. In the kampung (Malay village), the rice porridge is prepared in large quantities to be distributed to the community. 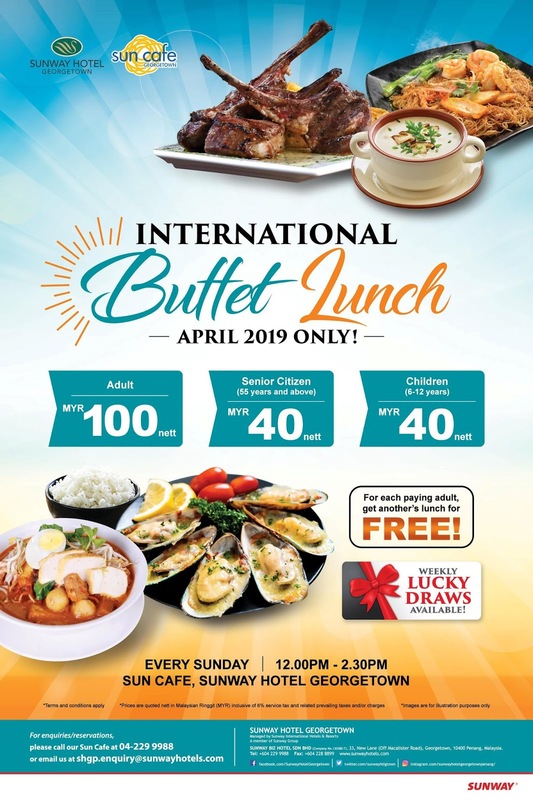 In this noble spirit of giving, Royale Chulan is giving away 200 servings of Bubur Lambuk to passers-by on 6 May 2019. 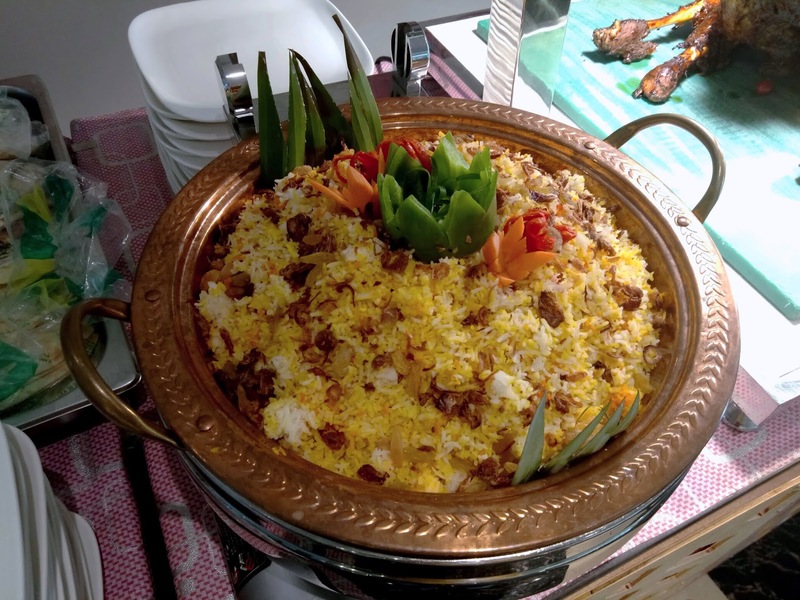 Royale Chulan has prepared not one, but four different rice dishes each evening: Nasi Hujan Panas, Nasi Briyani, Nasi Tomato and Nasi Dhall. Each variant uses a different mixture of spices, making it fragrant and tasty in a unique way. 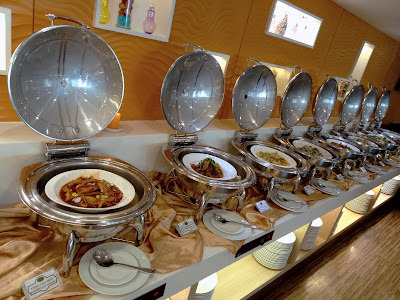 As for chafing dishes, Kepah Masak Cili Padi is meant to tantalize one's taste buds. Mussels are cooked with a creamy gravy that contains coconut milk and bird's eye chili. Yellow color of gravy comes from kunyit (turmeric). Should diners prefer poultry, Ayam Masak Merah Madu is a great choice. In this dish, chicken is wok-fried with sweet, tomato-based sauce. The sauce also contains honey and spices. A sprinkle of sesame seeds serves to enhance aesthetic appeal. Telur Itik Masak Lemak Cili Padi is a regional specialty of Negeri Sembilan. Compared to chicken eggs, duck eggs have arguably savorier taste. The eggs are cooked with turmeric-infused gravy, which improves savoriness to a whole new level. The open kitchen at Sri Tanjung Cafe is where à la minute dishes are prepared. According to the chef, the pasta counter is named "Pasta Mafia" because customers can "demand" their own pasta dishes. Pasta ingredients include spaghetti, penne, macaroni, linguine, fettuccine, prawns, mushrooms, capsicum, olives and more. Tomato and cream sauces are available. Cucur Harimau Menangis is a snack which pairs deep-fried puff pastry with a spicy curry. There are beef slices and potatoes in the curry. The curry is said to be so spicy that it makes tigers cry. I cannot agree any more. Be sure not to overlook the action stalls just outside the Boustead Building. The most aromatic dish here is Sotong Goreng Berempah. Springy calamari rings are coated with spicy batter, and then fried to golden perfection. What a delicacy indeed. 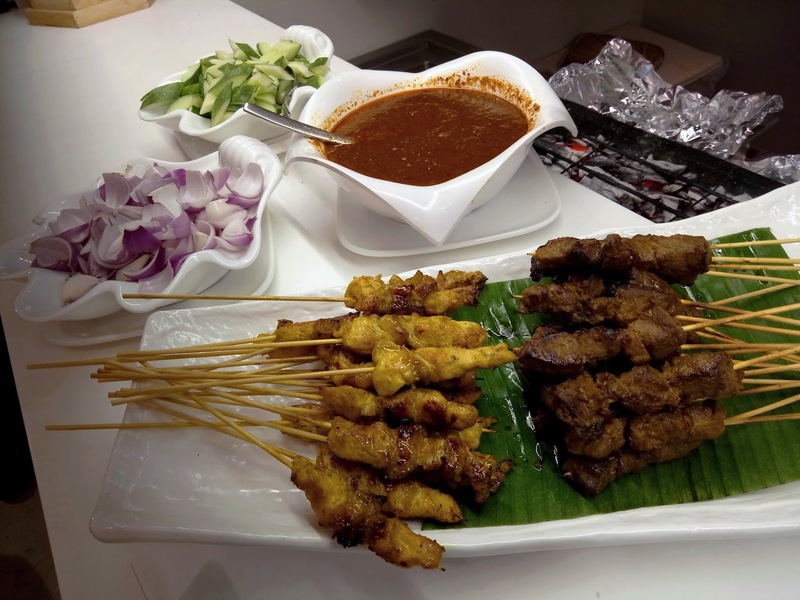 The charcoal grill produces a steady flow of delicious satay. Chicken and beef versions are prepared. 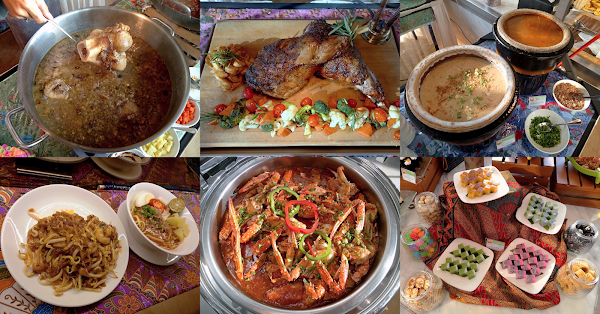 Other barbecued items this year are Kambing Panggang Golek (roast lamb) and three types of Ikan Bakar (grilled fish). 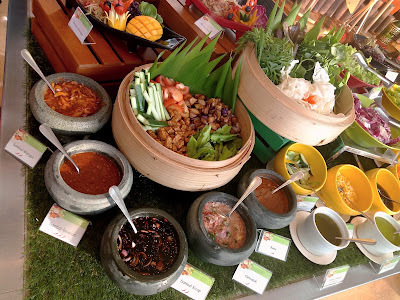 Ulam-Ulaman Kampung are assorted raw vegetables in a rattan basket. 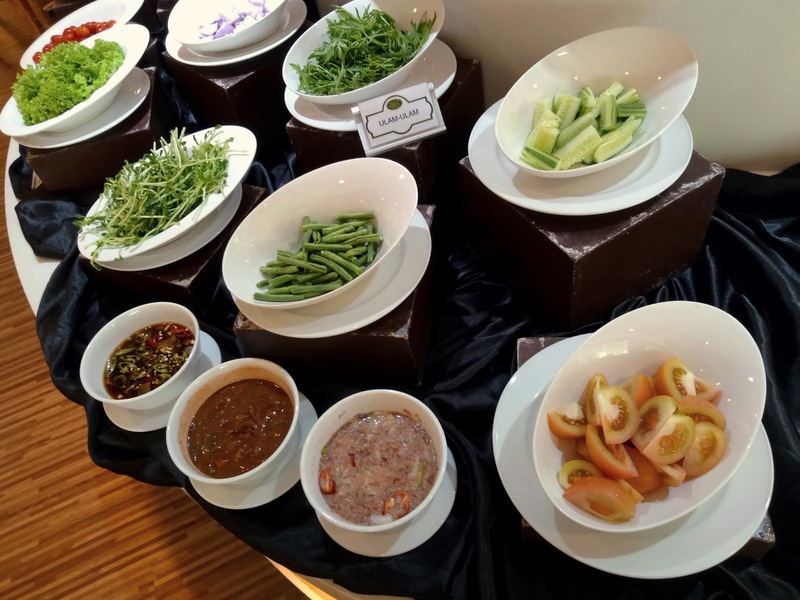 Since the vegetables are tasteless on their own, they are meant to be eaten with condiments like sambal belacan (spicy shrimp paste), sambal pudina (mint sauce), tempoyak (fermented durian paste) and budu (fermented anchovies). While the vast majority of Malay kuih are sweet, Kuih Cara Berlauk is a rare exception. This savory crêpe is topped with chicken, fried shallots and chili peppers. Its colorful appearance makes it a crowd favorite during festive events. 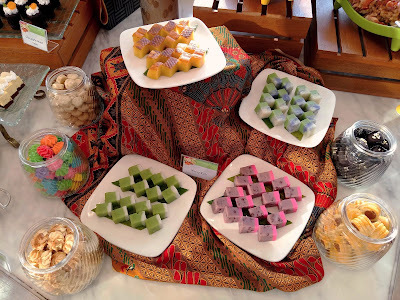 Other types of Malay kuih are Kuih Ketayap, Kuih Talam, Kuih Bakar, Cucur Badak and Cucur Keria just to name a few. Diners can also indulge in other sweet desserts like Mango Pudding, Pandan Panna Cotta, Strawberry Mousse, Fruit Jelly, Lemon Tarts and more. 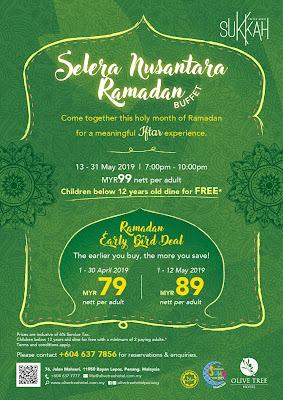 Royale Chulan Penang's buffet price is RM90.00 net per adult, and RM50.00 net per child or senior citizen. Early bird vouchers are available for purchase at discounted prices of RM72.00 net and RM40.00 net respectively. To encourage customers to come with their friends and family, the hotel is offering "Buy 6 Free 1" for adults. This promotion does not apply to early bird vouchers. Directions: From the ferry terminal at George Town, turn right and drive along Weld Quay (Pengkalan Weld). Royale Chulan Penang is located shortly on the left. There is a small lane right after the hotel, which leads to the main entrance and multi-level car park. Guests who dine in Sri Tanjung Cafe can get their parking tickets validated for a flat rate of RM5.00 per entry. 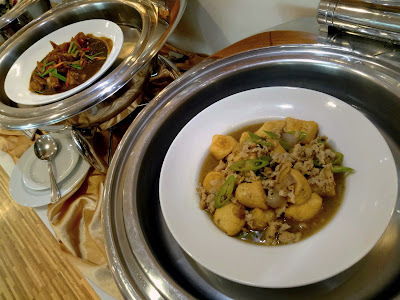 Special thanks to Sunway Hotel Georgetown for extending this food review invitation. Sun Cafe is the main eatery in Sunway Hotel Georgetown. The restaurant serves local and Western dishes throughout the day. Here is also where in-house guests are served breakfast. For the month of April, Sunway Hotel Georgetown is serving International Buffet Lunch every Sunday. As the name implies, the menu covers dishes from many cuisines. This is reflected by a dozen chafing dishes next to the open kitchen. Roasted Lamb is served at the carvery. The succulent lamb leg has a pink, juicy center. It comes with assorted vegetables and fries. Barbecue sauce and black pepper sauce are provided. Diners who enjoy red meat should really get a serving of Roasted Beef. The beef slices are flavored with lovely mushroom sauce. Crunchy pea sprouts on top serve as counterbalance to this savory dish. As for poultry, Roasted Chicken is cooked with tandoori-style seasoning. Fiery spices give the chicken the distinctive red color. The dish is garnished with lemon wedges and onion rings. Next, Japanese Bean Curd is served with minced chicken, onions and leek. Meanwhile, Kong Poh Squid is a Chinese-style dish that uses dried chili peppers. The buffet spread includes several vegetarian dishes like Braised Mixed Vegetables. 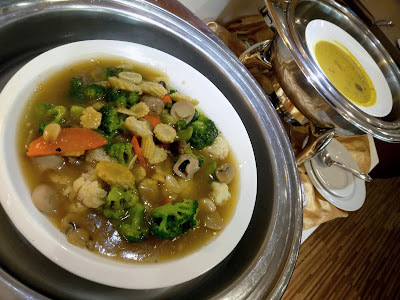 The colorful ensemble comprises of broccoli, carrots, baby corn, button mushrooms and straw mushrooms. 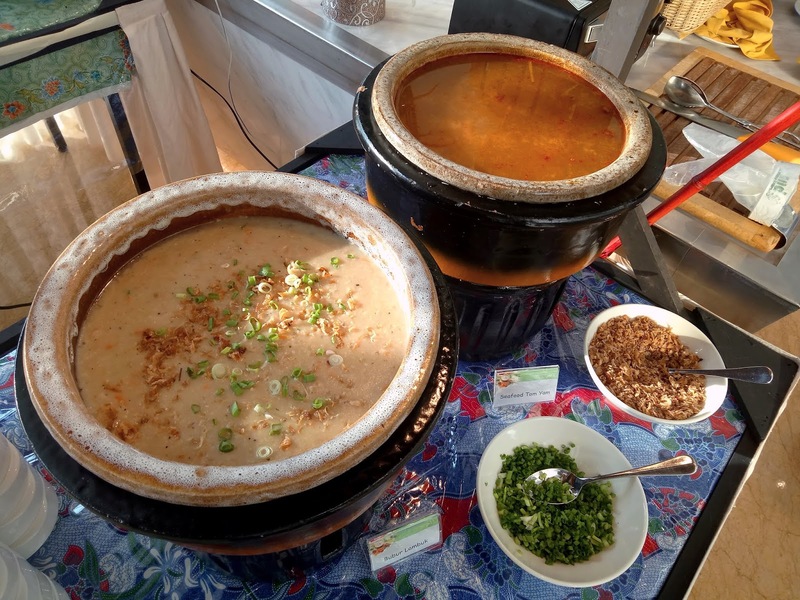 Two types of noodle soup are available today: Clear Soup and Curry. 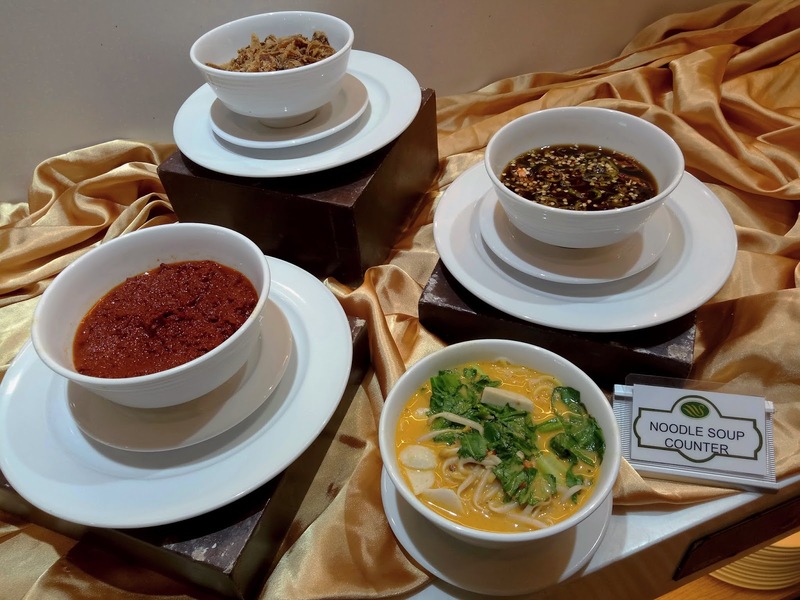 Customers can choose from three types of noodle: mee, koay teow and rice vermicelli. Condiments like chili paste, fried shallots and spicy soy sauce are provided. 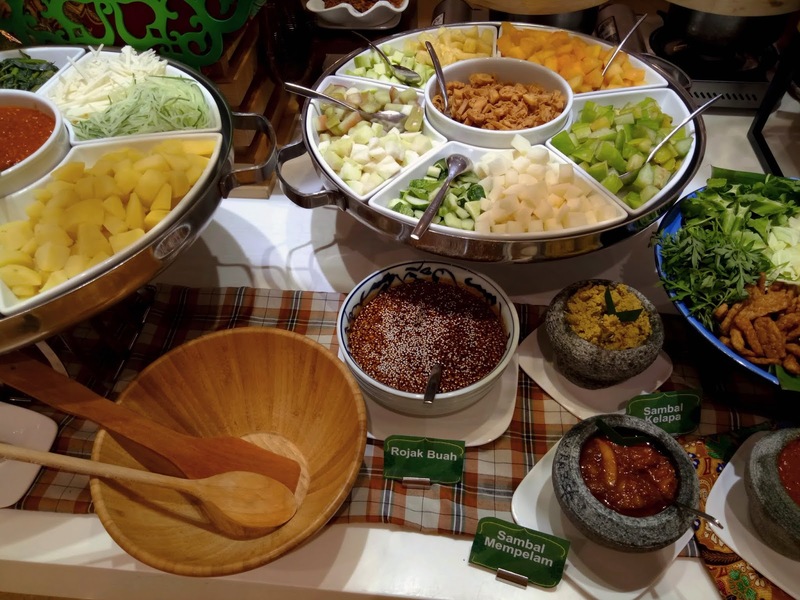 The salad bar allows diners to make their own salads using ingredients like romaine lettuce, red cabbage, onions and cherry tomatoes. Salad dressings like tartar sauce, Thousand Island and vinaigrette are provided. As for readymade salads, Apple Salad, Pineapple Coleslaw and Shredded Beef & Chili are highly recommended. Ulam-ulaman are local vegetables like yardlong beans and ulam raja (king's salad). The vegetables are typically eaten raw with condiments like budu (fermented anchovies), cincalok (fermented shrimps) and sambal kicap (spicy soy sauce). 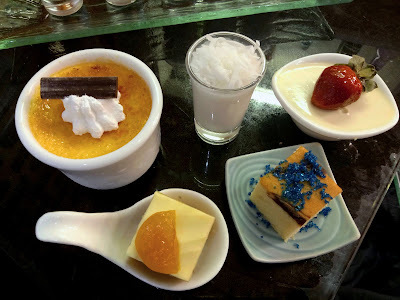 Moving to desserts, one can indulge in Crème Brûlée, Coconut Jelly, Honey Dew Pudding, Butter Cake and Carrot Cake. There is also an ice cream section to satisfy one's craving. 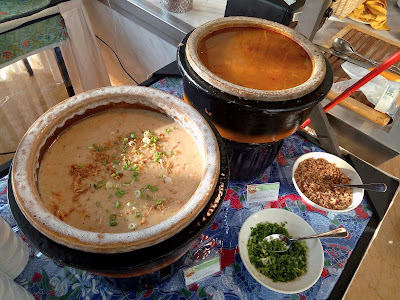 Should customers prefer something warm, Bubur Kacang Hijau (mung bean soup) is a good choice indeed. 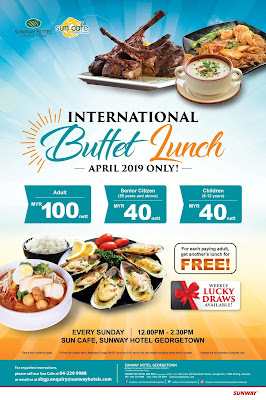 The International Buffet Lunch at Sunway Hotel Georgetown is priced at RM100.00 net per adult, and RM40.00 net per child or senior citizen. For each paying adult, another person's meal is on the house. Every Sunday, a lucky draw is held and each customer stands a chance to win prizes like dining vouchers. 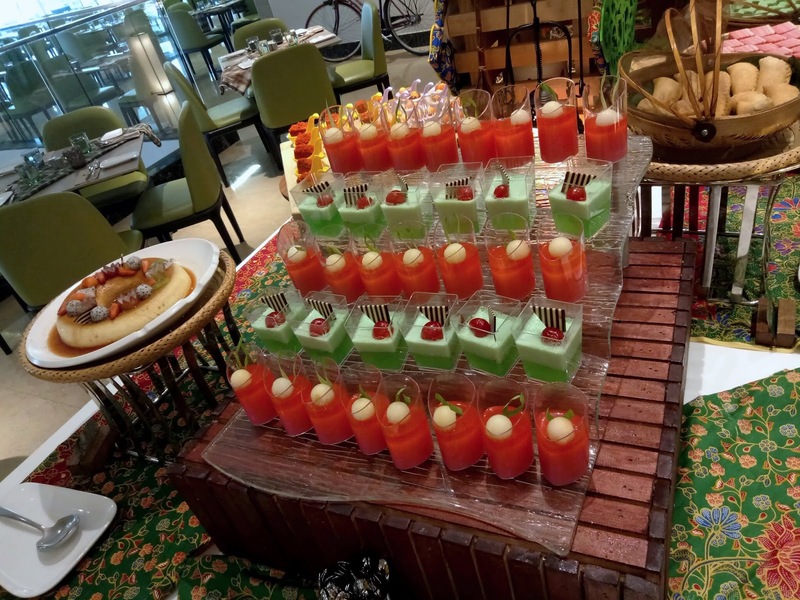 As for diners from the other side of Penang Strait, a similar buffet is held at Sunway Hotel Seberang Jaya. 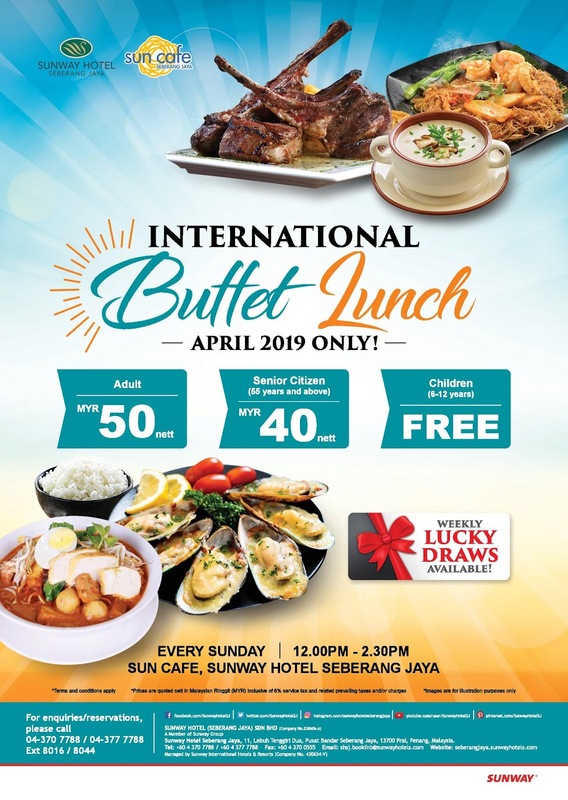 Directions: Sunway Hotel Georgetown is located at New Lane (Lorong Baru). It is accessible from either Macalister Road (Jalan Macalister) or Jalan Dato Keramat, but the former entrance is usually congested by hawker stalls. Sun Cafe is located at the ground level of the hotel. There are parking spaces inside the hotel as well as along New Lane. Special thanks to VOUK Hotel Suites for extending this food review invitation. 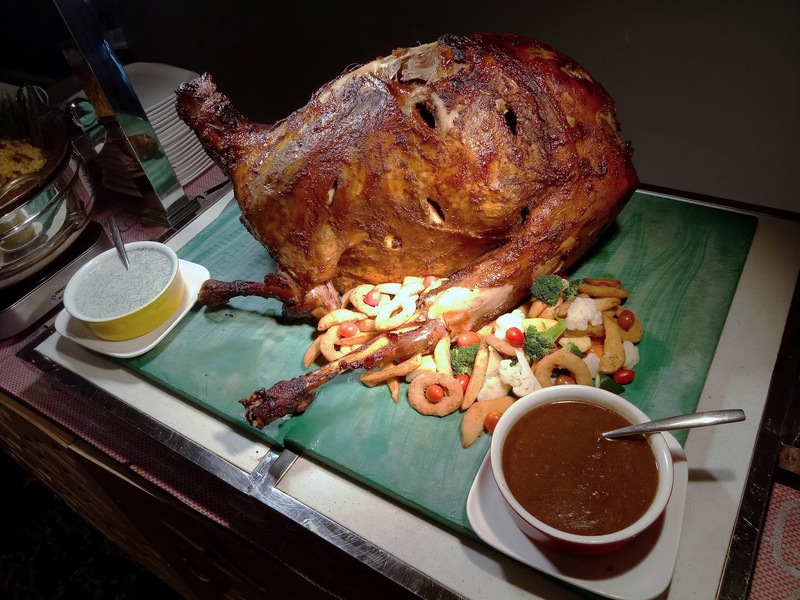 For the upcoming Ramadan season, VOUK Hotel Suites is rolling out the "3 Abdul Buffet Dinner". The buffet is served in C'est Si Bon Restaurant on Level 2. There are over 100 dishes each evening. The menu includes crowd favorites like Gulai Kawah Daging, Sup Gear Box, Murtabak and Waffles. The buffet features several live action counters where à la minute dishes are prepared. For instance, the grilling station produces a steady flow of grilled fish, prawns, squid and satay. Satay is best enjoyed with cucumber, onion and spicy peanut sauce. 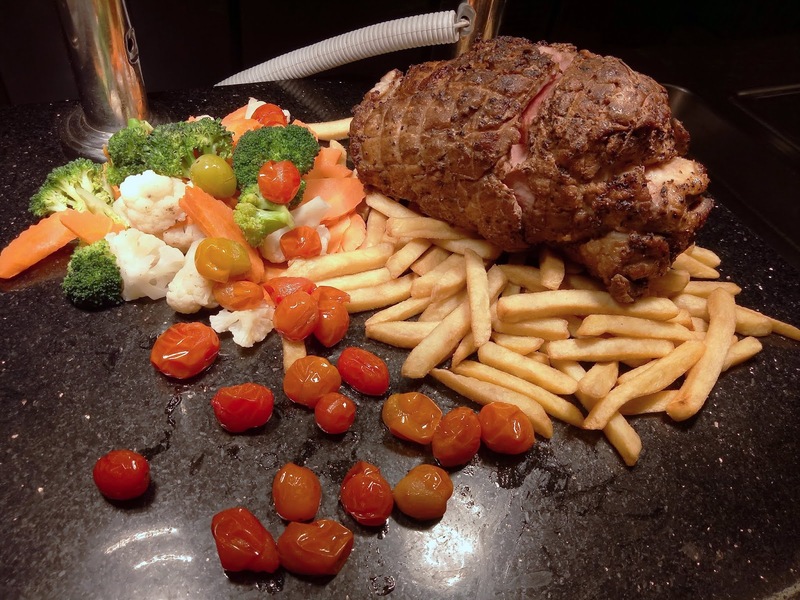 Tandoori Lamb Leg and Sirloin Steak are served at the carving station. Marinated and roasted to perfection, the meats are succulent indeed. The meats go well with black pepper, mushroom and mint sauces. Yong Tau Foo is one of the restaurant's specialties. Several types of vegetables and tofu are stuffed with fish paste. Yong Tau Foo can be served with clear soup or tom yum; I think the former is better because it allows the fish paste to take the center stage. There are around a dozen chafing dishes on daily rotation. The main highlight this evening is the Portuguese-Style Fried Whole Fish, where sea bass is served with tomato-based sauce. Other notable dishes are Beef Rendang Mamak, Lamb Vindaloo, Ayam Masak Hitam, Paru Masak Berempah and Udang Goreng Tahi Minyak. Deep-fried items include samosas, money bags and fish balls. Tomato and chili sauces are provided. When breaking fast, buah kurma (sweet dates) are usually eaten first as their sweetness gives a boost of energy. There are also a variety of kerabu (Malay salad) and acar (pickled vegetables) to keep the appetite up. My personal favorite delicacy is dodol, a toffee-like candy that comes in flavors like and durian. Pasembur is a Penang street food that is usually sold by mamak (Indian-Muslim) hawkers. 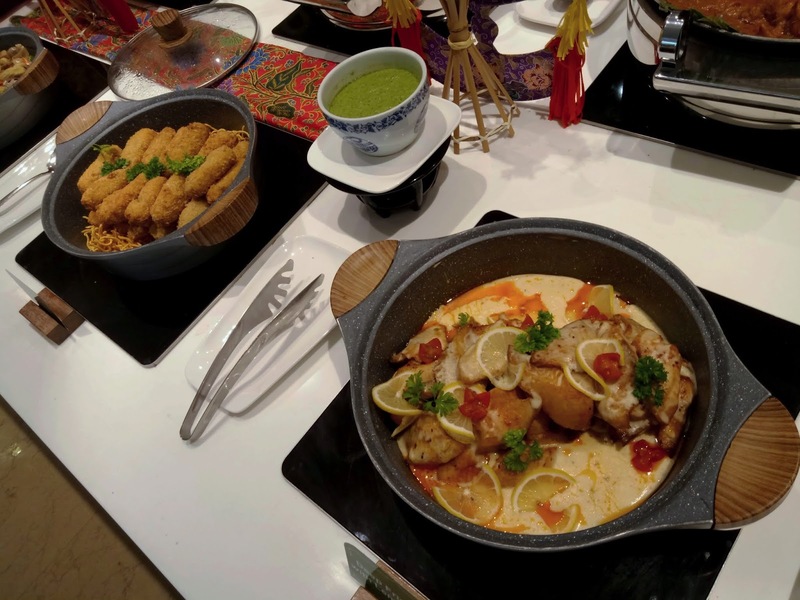 It consists of cucumber, sengkuang (jicama), cucur udang (prawn fritters), fish balls, tofu and hard-boiled eggs in sweet peanut sauce dressing. Meanwhile, Rojak Buah-Buahan is eaten with a thick sauce that contains belacan (shrimp paste). Moving to desserts, the pastry team has prepared a colorful selection of Western confections like Black Forest Cake, Oreo Cheesecake, Coconut Tarts, Mango Pudding, Orange Crème Caramel and Black & White Mousse. 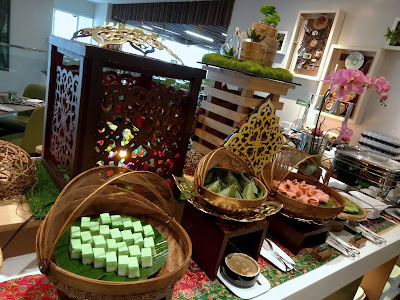 An iftar meal must include Malay kuih such as cucur badak (sweet potato ball with spicy coconut), kuih bingka ubi (tapioca cake) and kuih ketayap (pandan crêpes). Diners who prefer something warm can indulge in Serawa Durian (durian soup) and Bubur Pulut Hitam (black glutinous rice porridge). Meanwhile, children are most likely fascinated by the chocolate fountain. And finally for beverages, teh tarik (pulled milk tea) and susu badam (almond milk) are the main highlights this evening. Susu badam is prepared from actual almonds, with cardamom and cloves added into the mix to provide a lovely aroma. On Fridays and Saturdays, diners are entertained by a 4-piece band called Akustika Trios. The band's musical instruments are electric guitar, double bass, electronic keyboard and electronic drums. 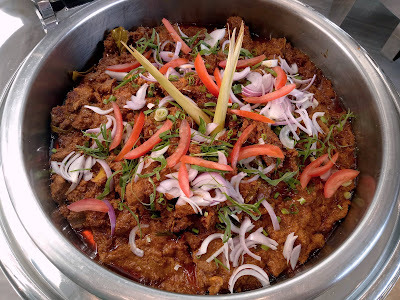 VOUK Hotel Suites serves 3 Abdul Buffet Dinner every evening from 7 May 2019 to 3 June 2019. The regular price is RM88.00 net per adult and RM68.00 net per child or senior citizen. For the first week (7 May 2019 to 12 May 2019), diners enjoy a discounted price of RM68.00 net. Besides a daily lucky draw, each customer also stands a chance to win a 55-inch LED television at the end of Ramadan. Note that the Let's Get Fat! 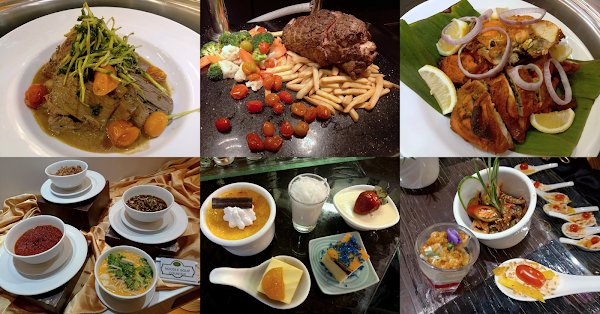 Fat-bulous Buffet Dinner will be suspended during this period. Directions: VOUK Hotel Suites is located on Jalan Sultan Ahmad Shah, right before The Northam and across the road from Gurney Beach Food Gallery. C'est Si Bon Restaurant is located at Level 2 of the main building. Parking is available in front of Hardwicke House. Dine-in customers enjoy complimentary parking; parking tickets can be validated at the restaurant. 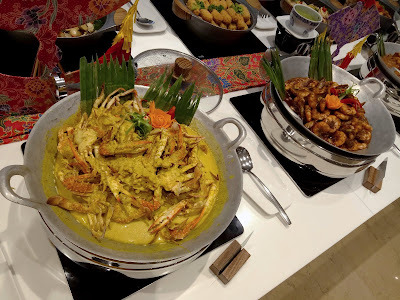 Special thanks to Eastin Hotel Penang for extending this food review invitation. 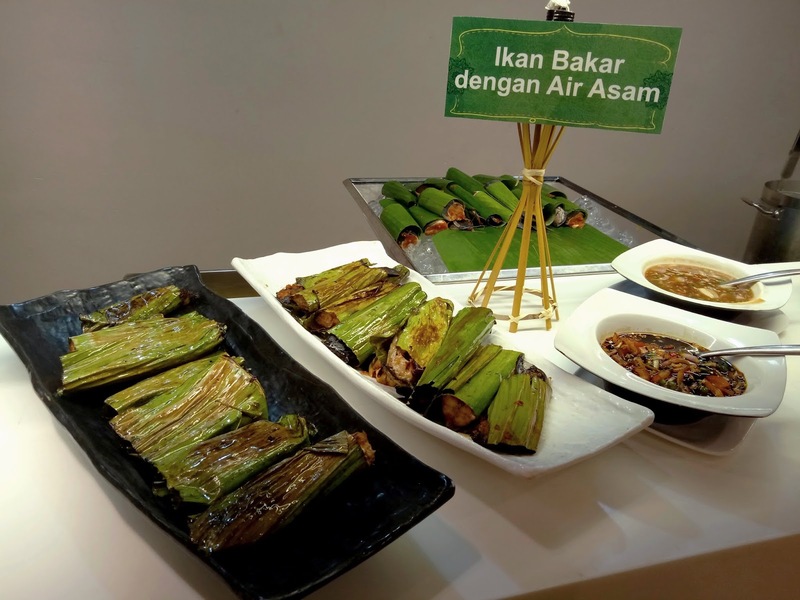 For the upcoming Ramadan season, Eastin Hotel Penang is serving "Sajian Aneka Rasa" buffet dinner every evening from 7 May 2019 to 4 June 2019. 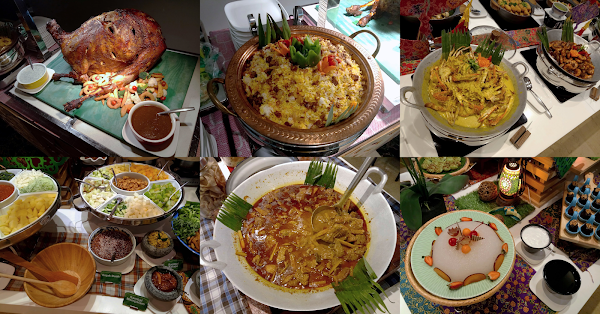 The menu is a diverse combination of local dishes and hawker food. Dinner is served at Swez Brasserie. Today's preview covers approximately 80% of the actual buffet spread. 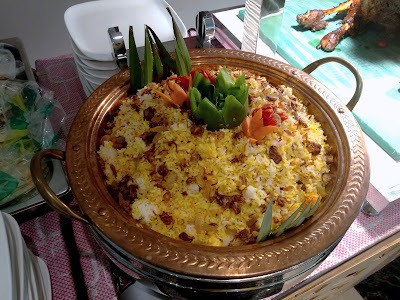 Bubur Lambuk is a must-have dish when breaking fast. This savory porridge goes well with spring onions and fried shallots. Bubur Lambuk is typically cooked in a large amount to be served in a communal setting. As for something spicy, go for Seafood Tom Yum instead. Sup Gear Box Utara is one of the more popular dishes this evening. The rich broth is prepared from the mutton and a variety of spices. 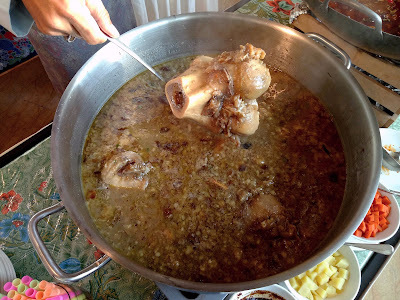 Interestingly, the soup is called "gearbox" because the goat's femur resembles a gear stick. Straws are provided to diners who wish to extract savory marrow from the bones! Moving to the carvery, Roast Lamb Leg is served this evening. 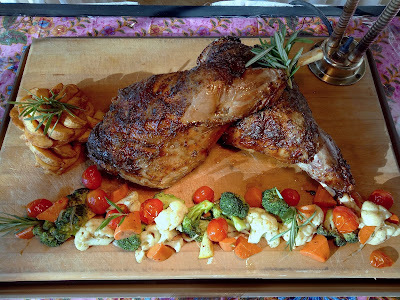 Marinated for several hours, the mutton is roasted until it turns golden brown. 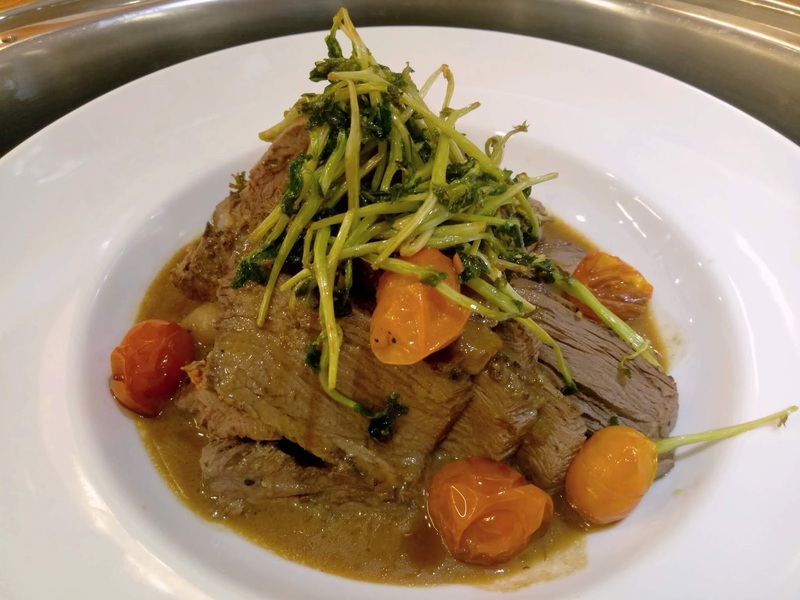 The mutton is best enjoyed with rosemary sauce. During the Ramadan, a whole goat will be prepared every evening. Satay is Malaysia's favorite street food. Two types are prepared today: chicken and beef. The meats are marinated with spices like turmeric, and then grilled over burning charcoal. 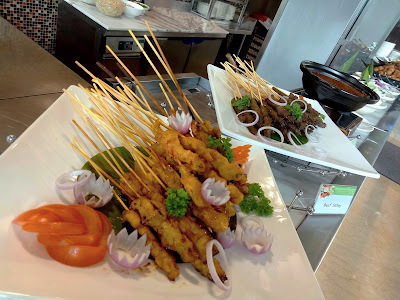 Satay is typically served with sweet-spicy peanut sauce, ketupat (rice dumplings), sliced cucumber and onions. Penang Char Koay Teow is the state's most iconic dish. I am satisfied with how well the dish turns out. The fiery aroma imparted to the noodle is simply amazing. 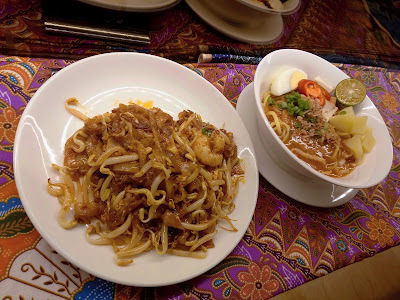 Meanwhile, Mee Rebus is a signature dish of Chef Shukri, who is also responsible for crafting many Malay dishes this evening. 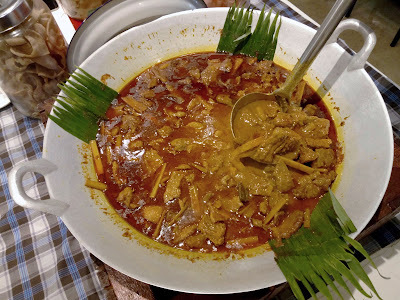 Rendang Daging is a Malaysian take on the Minangkabau delicacy. 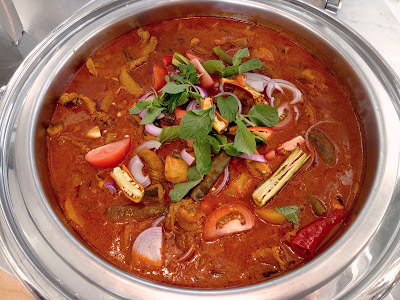 Beef is cooked with coconut milk and spices until most liquid has evaporated. The resulting beef is extremely savory. 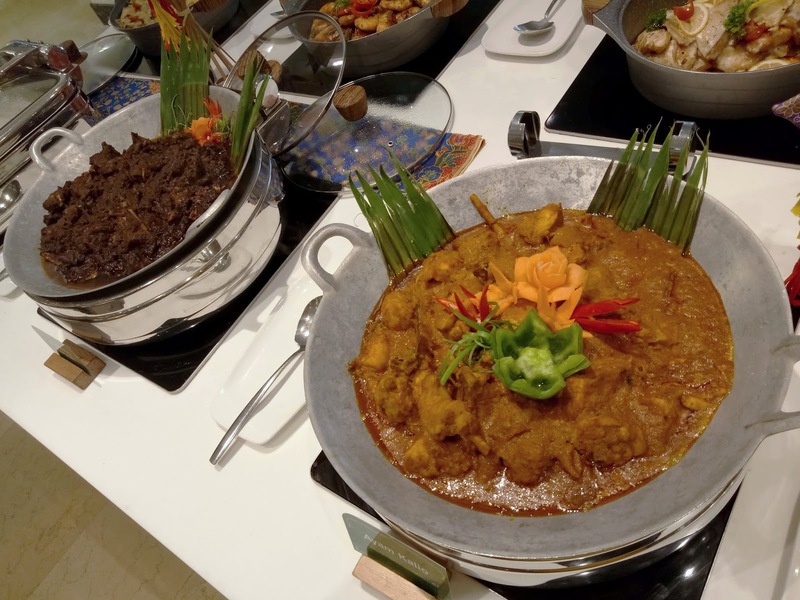 The Malaysian variant of rendang is not as dark as the original version. Cili Ketam A'la Singapura, more commonly known as Singapore Chili Crab, is stir-fried with tomato and chili sauces. Despite its name, this dish is sweeter than it is spicy. 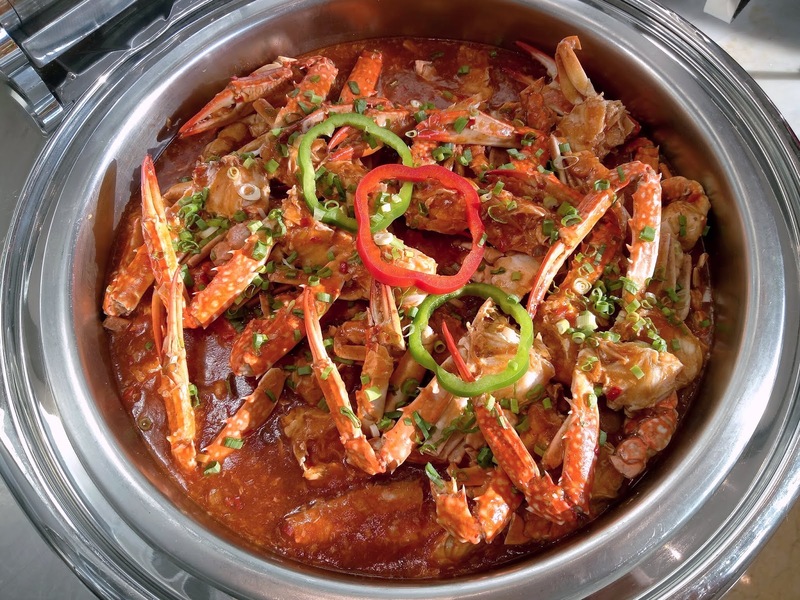 The traditional recipe uses mud crabs, but in order to comply with halal requirements, flower crabs are used instead. 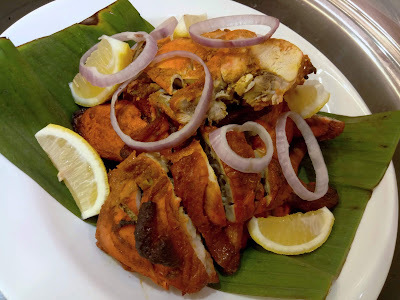 Kari Telur Ikan is a delicacy that is not commonly encountered. The curry contains fish roe, which has a unique, grainy texture. Unfortunately, the curry does not penetrate the roe deep enough. Perhaps heavier seasoning would have helped. Ulam-Ulaman comprises of ulam raja (king's salad), daun pegaga (Asiatic pennywort leaves), daun gajus (cashew leaves) and kacang botol (winged beans). 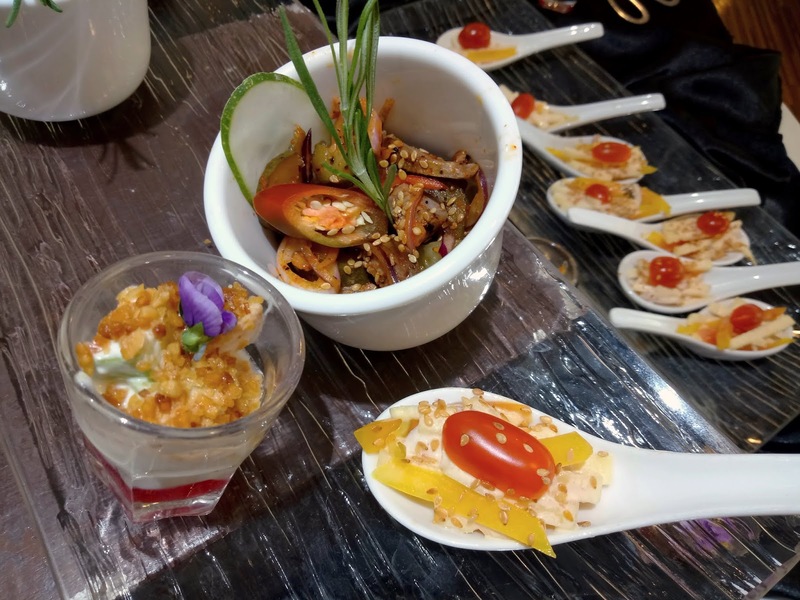 These raw vegetables are customarily dipped into condiments like sambal belacan (spicy shrimp paste), budu (fermented anchovies) and cincalok (fermented shrimps). Today's choices of Malay kuih are kuih talam pandan (pandan cake), kuih talam keladi (sweet potato cake), kuih bingka ubi (tapioca cake) and kuih seri muka (two-layer cake). 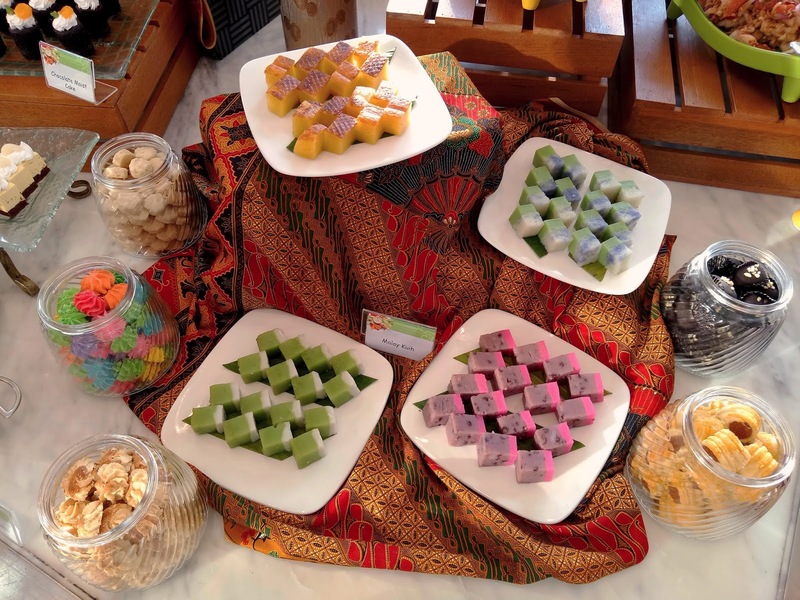 More Malay kuih will be available during Ramadan dinners. In addition, there are several jars of cookies to satisfy one's sweet tooth. I am impressed by the assortment of Western confections this evening. 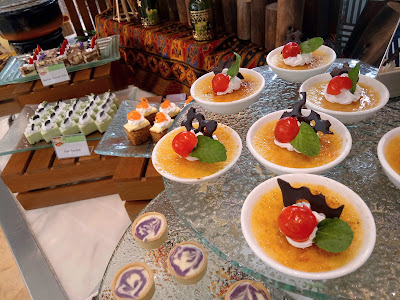 Notable items are Citrus Crème Brûlée, Blueberry Cheese Tartlets, Carrot Cake, Pandan Cake, Marble Cheesecake, Banana Cake and Chocolate Moist Cake. Compliments to the in-house pastry team! 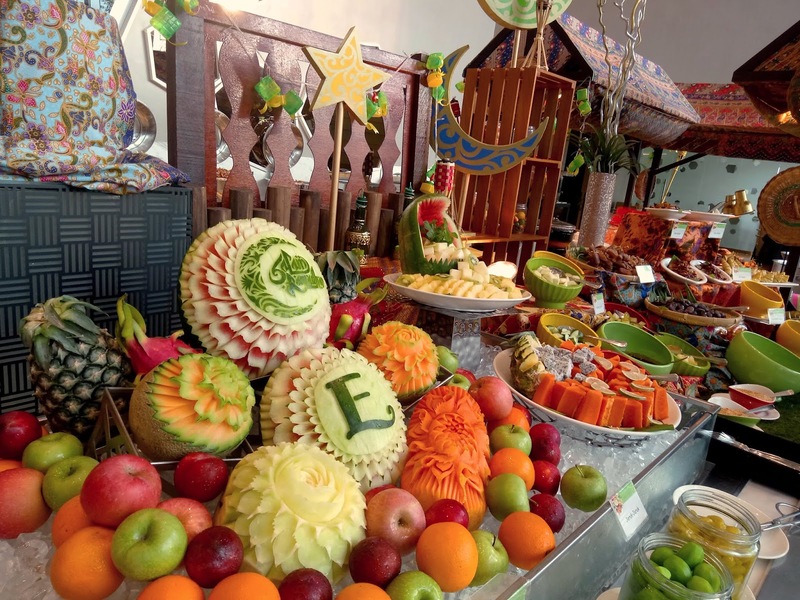 Eastin Hotel Penang's "Sajian Aneka Rasa" buffet dinner is priced at RM120.00 net for adults, RM60.00 net for children, and RM70.00 net for senior citizens. Early bird vouchers are available for purchase for RM100.00 net. In addition, the hotel is having a "secret" promotion of vouchers for only RM88.00 net. This special voucher can only be redeemed between 7 May 2019 and 12 May 2019. Check out the hotel's Facebook post for details. Directions: Eastin Hotel Penang is located along Tun Dr Lim Chong Eu Expressway (Lebuhraya Tun Dr Lim Chong Eu) and is conveniently next to Queensbay Mall. Swez Brasserie an eatery next to the hotel lobby. There are parking spaces at the basement levels of the hotel.